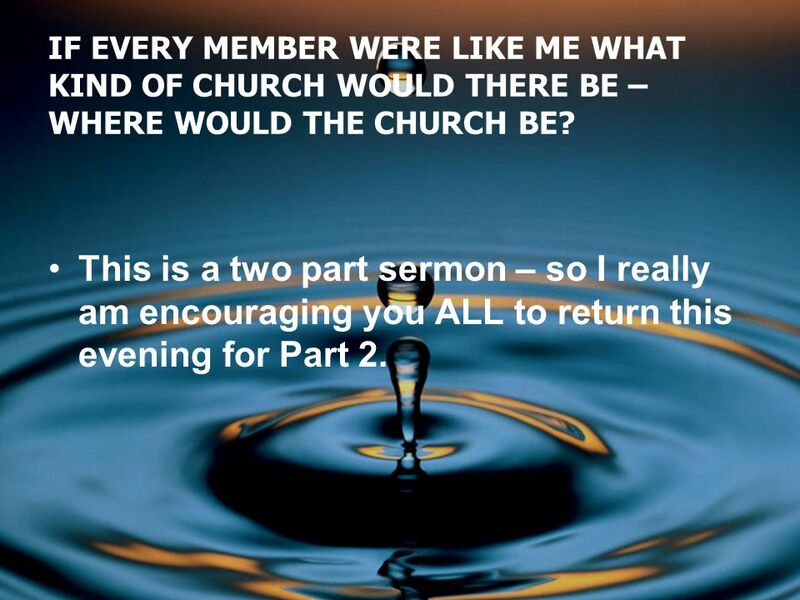 2 IF EVERY MEMBER WERE LIKE ME WHAT KIND OF CHURCH WOULD THERE BE – WHERE WOULD THE CHURCH BE? 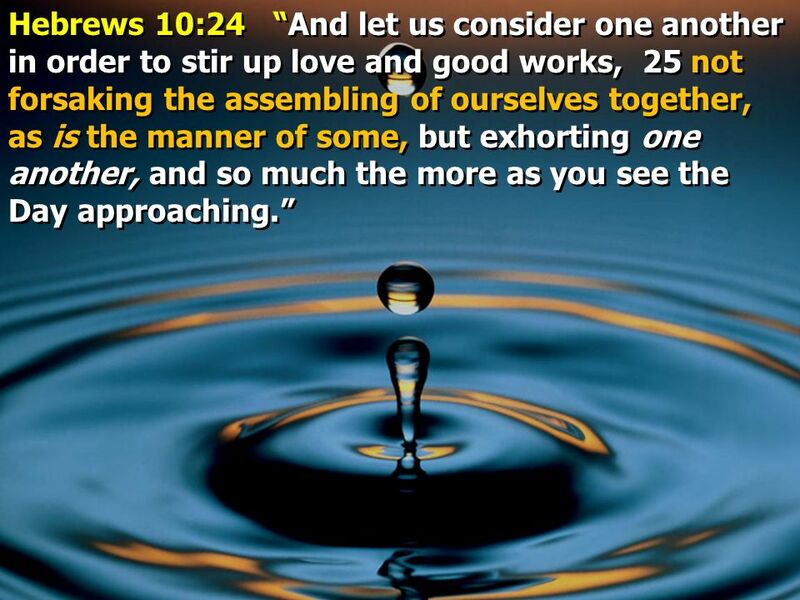 This is a two part sermon – so I really am encouraging you ALL to return this evening for Part 2. 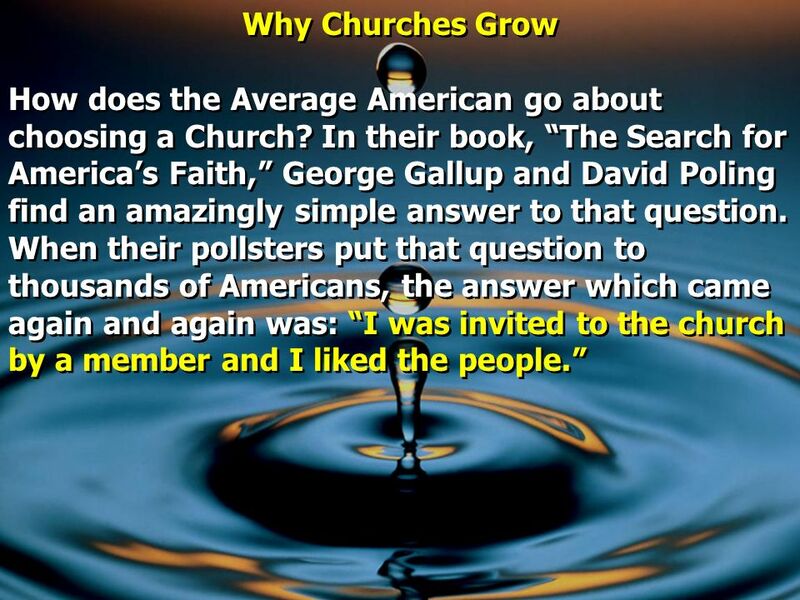 3 Part 1 -- IF EVERY MEMBER WERE LIKE ME WHAT KIND OF CHURCH WOULD THERE BE – WHERE WOULD THE CHURCH BE? 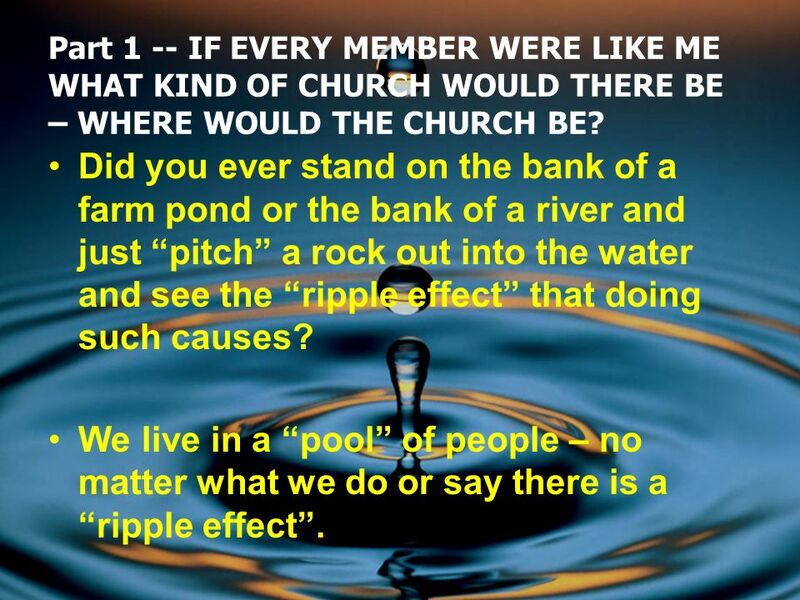 Did you ever stand on the bank of a farm pond or the bank of a river and just “pitch” a rock out into the water and see the “ripple effect” that doing such causes? We live in a “pool” of people – no matter what we do or say there is a “ripple effect”. 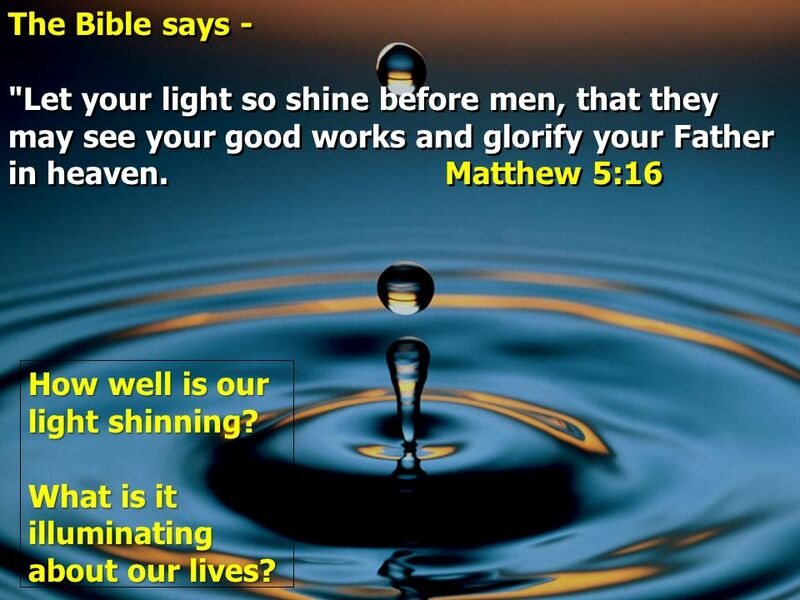 4 The Bible says - "Let your light so shine before men, that they may see your good works and glorify your Father in heaven Matthew 5:16 How well is our light shinning? What is it illuminating about our lives? Is our “company” rubbing off on us or are we rubbing off on them? 6 1 Corinthians 4:14 I do not write these things to shame you, but as my beloved children I warn you. 15 For though you might have ten thousand instructors in Christ, yet you do not have many fathers; for in Christ Jesus I have begotten you through the gospel. 16 Therefore I urge you, imitate me. 1 Corinthians 11:1 Imitate me, just as I also imitate Christ. 7 1. If every member were like me what kind of church would there be? Would you want people to be like you and follow in your footsteps? Are you following the example of Christ? If everyone was to follow your influence, would it be for the better or for the worse? 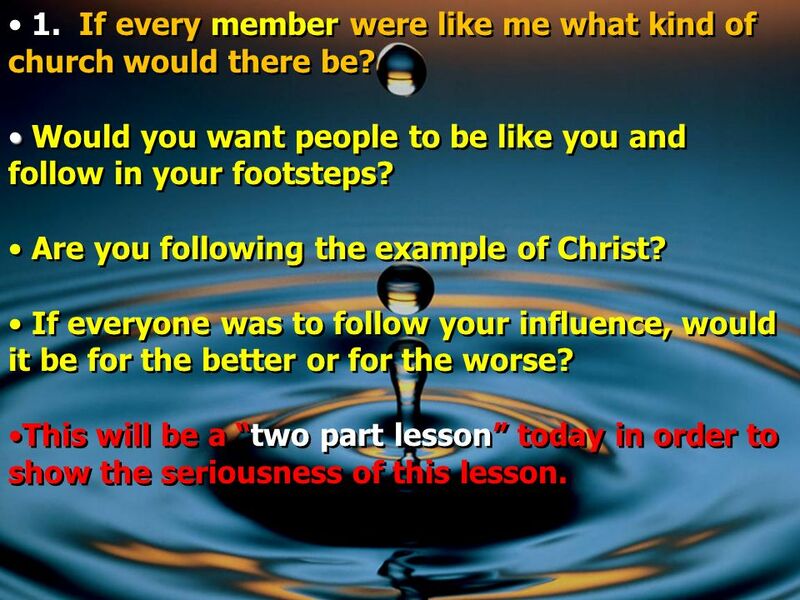 This will be a “two part lesson” today in order to show the seriousness of this lesson. 8 A. If every member were like me, what time would they arrive to the services? Is the building ready? Are classrooms and materials ready? Are all the service needs met? Are the services getting started on time……. How interested am I in worshipping and learning about my Lord? If every member were like me…. 10 Psalm 63:1 O God, You are my God; Early will I seek You; My soul thirsts for You; My flesh longs for You In a dry and thirsty land Where there is no water. 2 So I have looked for You in the sanctuary, To see Your power and Your glory. 3 Because Your lovingkindness is better than life, My lips shall praise You. Psalm 122:1 I was glad when they said to me, "Let us go into the house of the LORD.“ Are we longing to go - are we glad to go – do we HAVE TO GO or get TO GO? 11 If every member were like me, what time would they arrive to the services? 12 B. If every member were like me, how often would we have services? Pliny, a secular writer about 112 A.D., made a report to the emperor Trajan in which he unconsciously bore witness to certain vital aspects of Christianity. Of special interest was the witness he bore to the tenacity maintained by the Christians in regard to their assemblies. They attended the regular worship services in spite of every hindrance. Legal meetings on a publicly recognized day of rest, as in these days, were impossible. Christians met in the darkness of pre-dawn assemblies; and no impediment whatever was allowed to interfere. As Pliny said, "On an appointed day they had been accustomed to meet before daybreak." 15 He went ahead to relate that their services were nothing of a scandalous or improper kind, that they partook of a meal of the most harmless and ordinary variety, that each sang a hymn to Christ as God, and that they bound themselves with a promise not to commit fornication or theft or any other crime. This witness of Pliny reaches back to within a very few years of the apostles themselves and is a valuable independent testimony bearing. 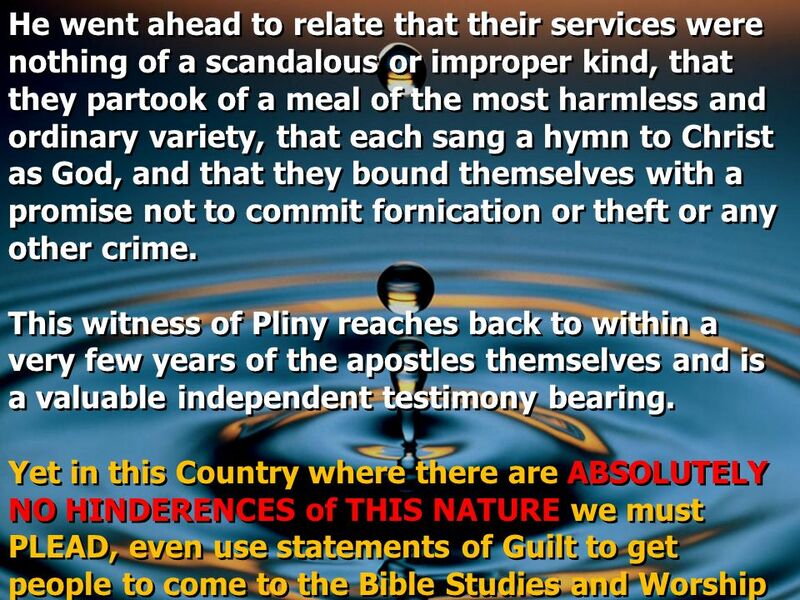 Yet in this Country where there are ABSOLUTELY NO HINDERENCES of THIS NATURE we must PLEAD, even use statements of Guilt to get people to come to the Bible Studies and Worship Services. 16 Hebrews 13:17 “Obey those who rule over you, and be submissive, for they watch out for your souls, as those who must give account. 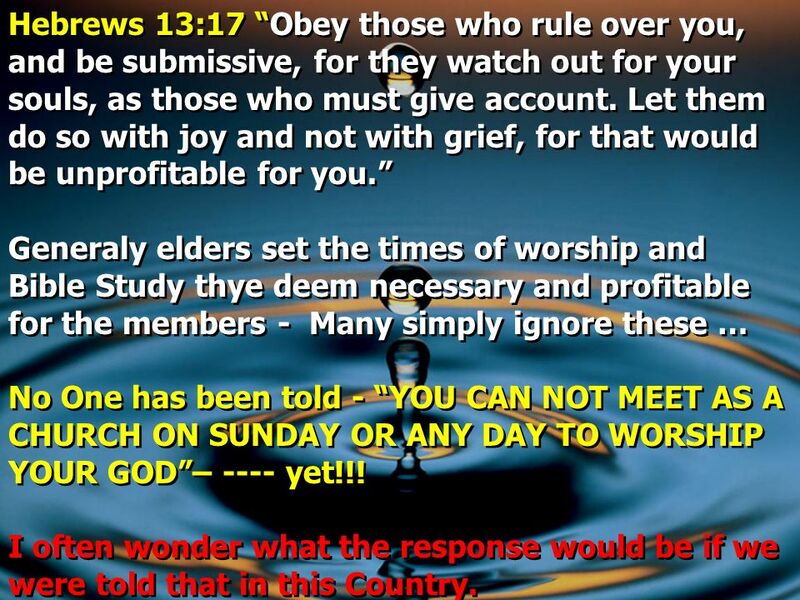 Let them do so with joy and not with grief, for that would be unprofitable for you.” Generaly elders set the times of worship and Bible Study thye deem necessary and profitable for the members - Many simply ignore these … No One has been told - “YOU CAN NOT MEET AS A CHURCH ON SUNDAY OR ANY DAY TO WORSHIP YOUR GOD”– ---- yet!!! I often wonder what the response would be if we were told that in this Country. 17 Are you opposed to learning more about God? 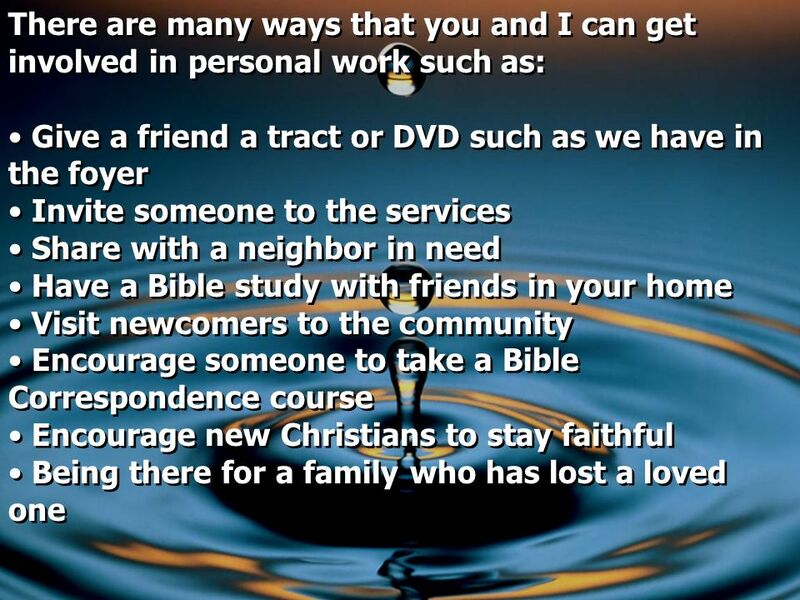 Are you opposed to spending more time with your brethren? How can you be concerned for one another, how do know the sufferings and rejoicings of your brothers and sisters in Christ, I Corinthians 12:25 &26 – It’s a command. How do we “Rejoice with them that do rejoice, and weep with them that weep.” Romans 12:15 So what is the excuse or the reason? 18 Out of 168 hours in a week, we only have to find 4 hrs to worship God and study about Him. That works out to be about 2.3% of the total time in a week. 19 Can we honestly say that we are being a good example and influence when we neglect the worship service and Bible class when we could make it? 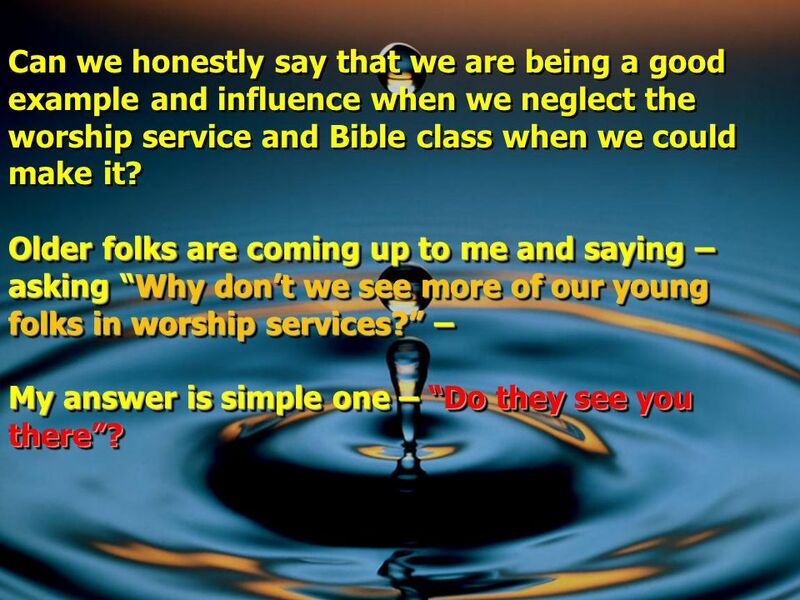 Older folks are coming up to me and saying – asking “Why don’t we see more of our young folks in worship services?” – My answer is simple one – “Do they see you there”? 20 What are you going to say to Jesus if He comes back at 6:15 on Sunday night or 7:15 pm on Wednesday evening and you chose to stay home for no valid reason? 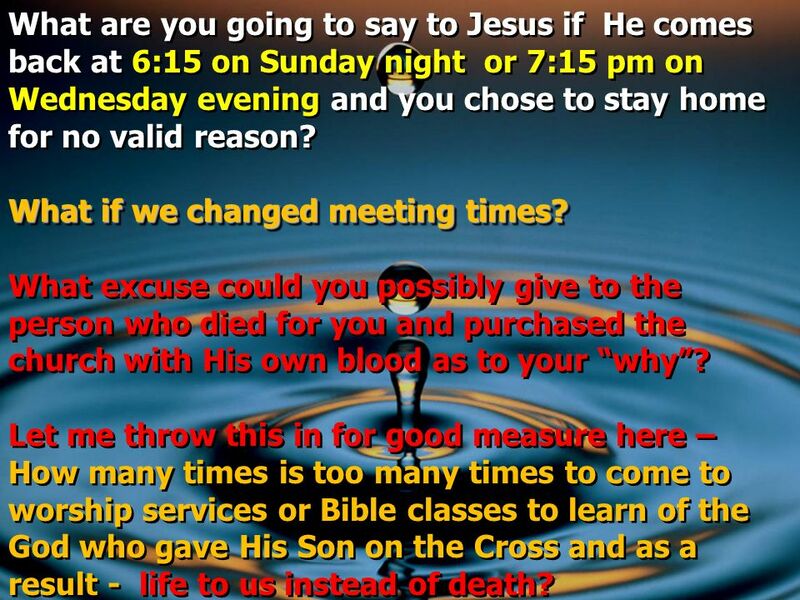 What if we changed meeting times? What excuse could you possibly give to the person who died for you and purchased the church with His own blood as to your “why”? 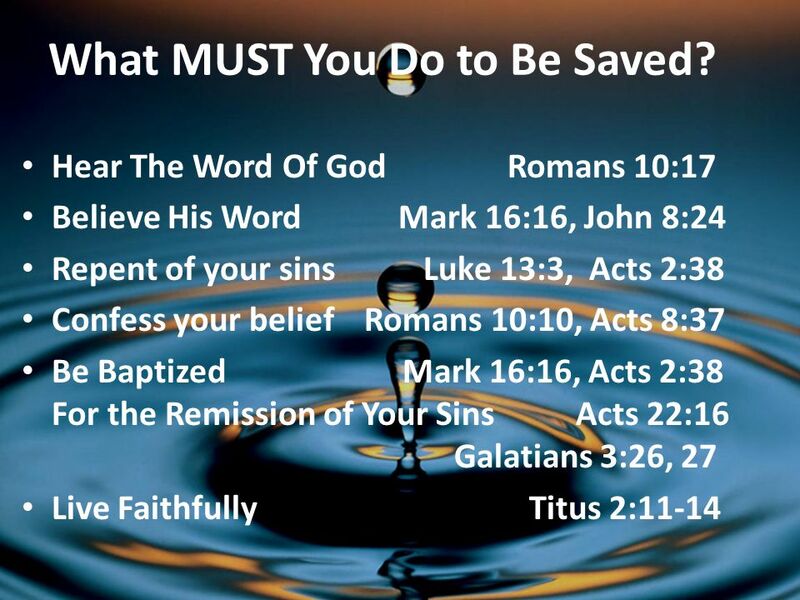 Let me throw this in for good measure here – How many times is too many times to come to worship services or Bible classes to learn of the God who gave His Son on the Cross and as a result - life to us instead of death? 21 C. If every member studied their Bible like me, how often would they study and how much would they know? 22 A young man took some young people down into the basement of their church building and everything was gone except the chairs. He told them there has been a nuclear war and this basement is a fallout shelter. All we have is food and water. 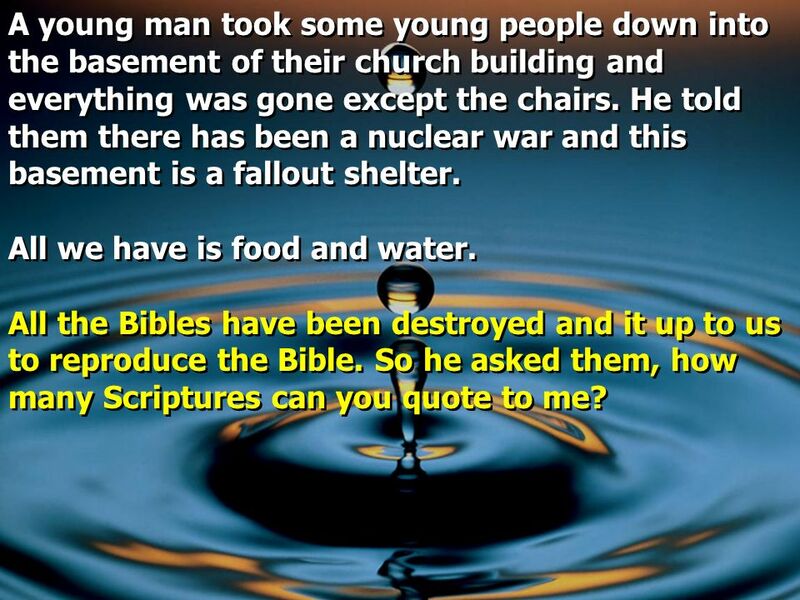 All the Bibles have been destroyed and it up to us to reproduce the Bible. So he asked them, how many Scriptures can you quote to me? 23 2 Timothy 2:15 “Study to shew thyself approved unto God, a workman that needeth not to be ashamed, rightly dividing the word of truth.” Compared to everything else you read and do -how much time do you give to reading – studying - your Bible? 24 1 Peter 3:15 “But sanctify the Lord God in your hearts, and always be ready to give a defense to everyone who asks you a reason for the hope that is in you, with meekness and fear;” If someone walked up to you after the services because they see you leaving the Church Building and asked you “What must I do to be saved?” – could you “explain” it to them from your knowledge of the Bible or would you say – let me get the preacher or the elders to answer that for you? Has your heart a place where God truly dwells? Are we “growing and alive” or are we “stagnated and dead”? 26 Romans 1:16 “For I am not ashamed of the gospel of Christ, for it is the power of God to salvation for everyone who believes, for the Jew first and also for the Greek.” Are we “ashamed” or are we “Proud” ? Do we believe in the “power of God’s message” or not? Do we “pick and choose” who we take it too? 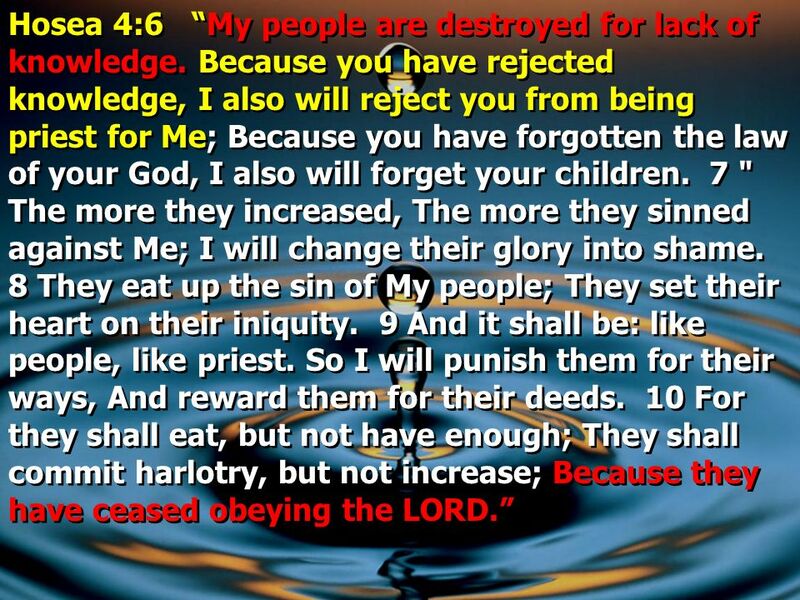 28 Are we being destroyed due to our lack of knowledge of God’s Word? Is what is happening to this land we live in – OUR - fault or someone else’s? 29 John 12:48 "He who rejects Me, and does not receive My words, has that which judges him -- the word that I have spoken will judge him in the last day. 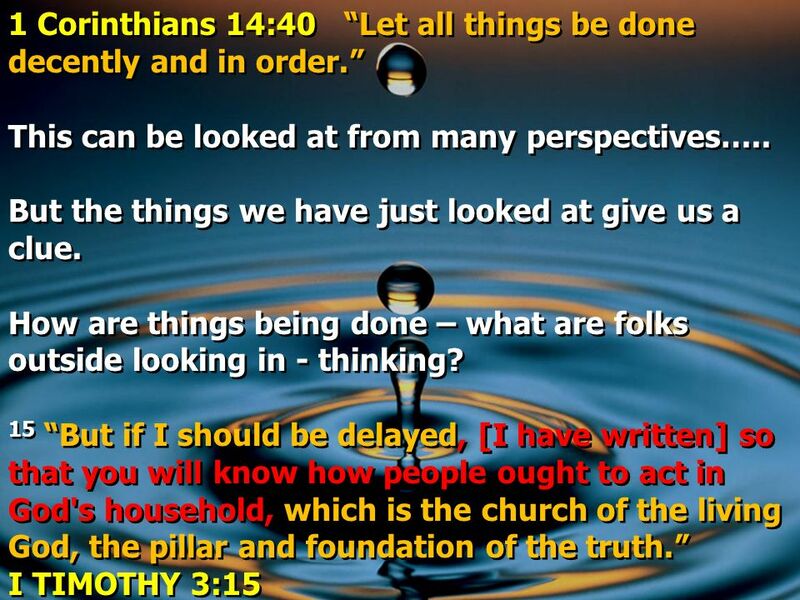 If we are going to judged by His Word, and we are, then would it not behoove us to know what it says? 30 IF EVERY MEMBER WERE LIKE ME WHAT KIND OF CHURCH WOULD THERE BE? 31 IF EVERY MEMBER WERE LIKE ME WHAT KIND OF CHURCH WOULD THERE BE? 32 1. If every member were like me, what time would we arrive at our services? 2. If every member were like me, how often would we have services? 3. If every member were like me, how often would we study our Bibles? 33 Part 2 D. If every member took part in singing like me, what kind of singing would there be? 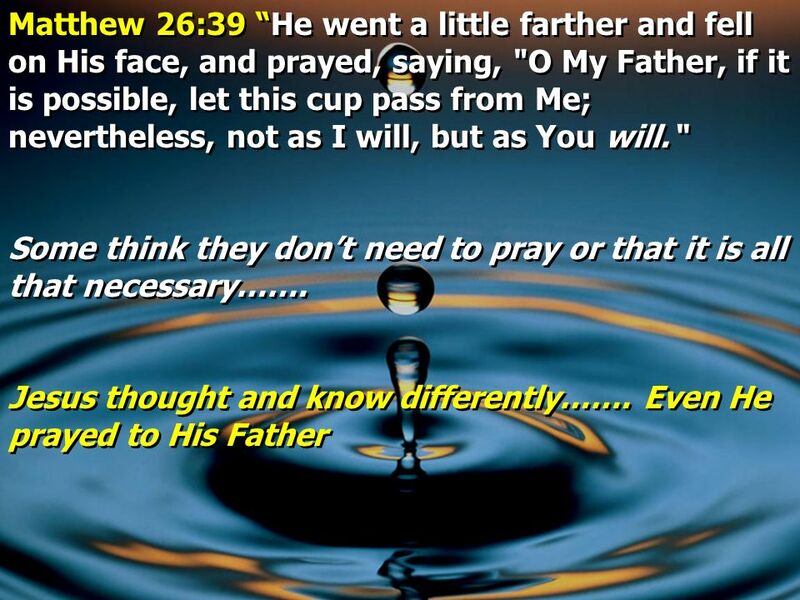 35 If every member prayed like me, what would their prayer life be? This one pretty much goes without discussion….. But what is our prayer life like? Do you pray before a meal – in front of the children – in public? 36 1 Thessalonians 5:17 “pray without ceasing, 18 in everything give thanks; for this is the will of God in Christ Jesus for you.” Doesn’t sound like an “option” does it? 37 James 1:5 If any of you lacks wisdom, let him ask of God, who gives to all liberally and without reproach, and it will be given to him. 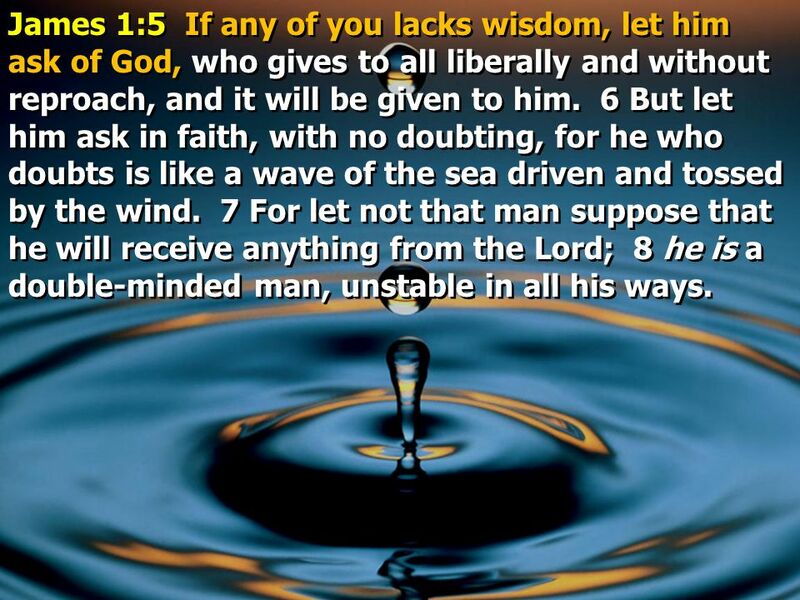 6 But let him ask in faith, with no doubting, for he who doubts is like a wave of the sea driven and tossed by the wind. 7 For let not that man suppose that he will receive anything from the Lord; 8 he is a double-minded man, unstable in all his ways. 39 E. If every member gave like me, how much giving would there be? Well this is the contribution drops – we mentioned those “words, giving, contribution” – MONEY. 41 1 Corinthians 16:2 On the first day of the week let each one of you lay something aside, storing up as he may prosper, that there be no collections when I come. 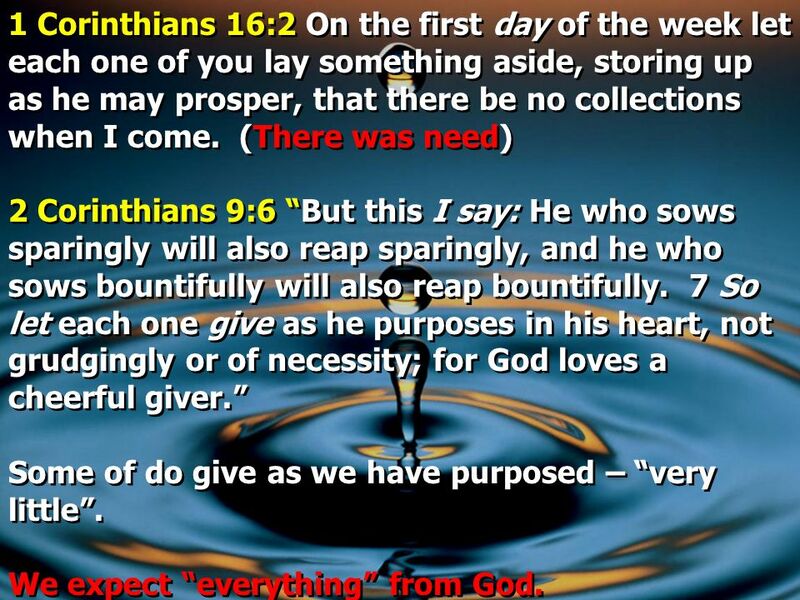 (There was need) 2 Corinthians 9:6 “But this I say: He who sows sparingly will also reap sparingly, and he who sows bountifully will also reap bountifully. 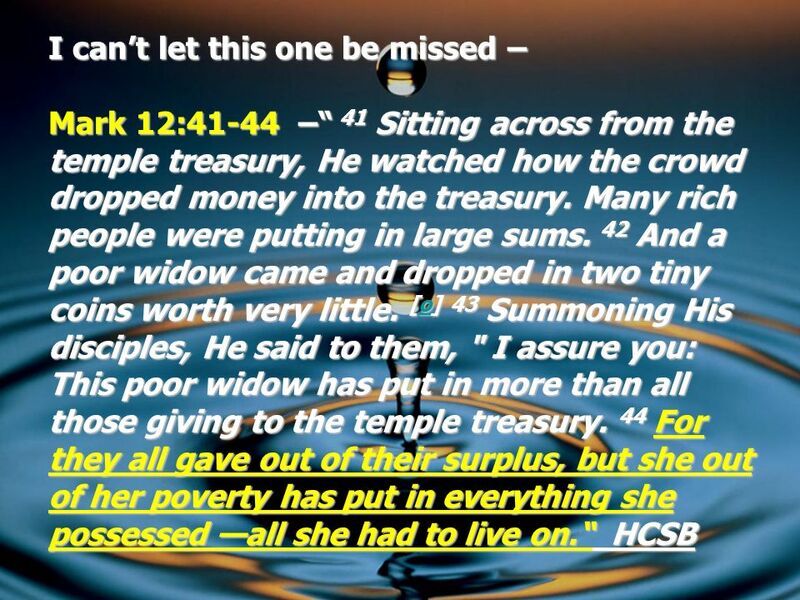 7 So let each one give as he purposes in his heart, not grudgingly or of necessity; for God loves a cheerful giver.” Some of do give as we have purposed – “very little”. We expect “everything” from God. 42 1 Timothy 6:7 For we brought nothing into this world, and it is certain we can carry nothing out. 8 And having food and clothing, with these we shall be content. 43 If every member gave like me, how much giving would there be? 44 F. If every member partook of the Lord’s Supper like me, how much remembrance would there be? 45 1 Corinthians 11:23 For I received from the Lord that which I also delivered to you: that the Lord Jesus on the same night in which He was betrayed took bread; 24 and when He had given thanks, He broke it and said, "Take, eat; this is My body which is broken for you; do this in remembrance of Me." 25 In the same manner He also took the cup after supper, saying, "This cup is the new covenant in My blood. This do, as often as you drink it, in remembrance of Me." 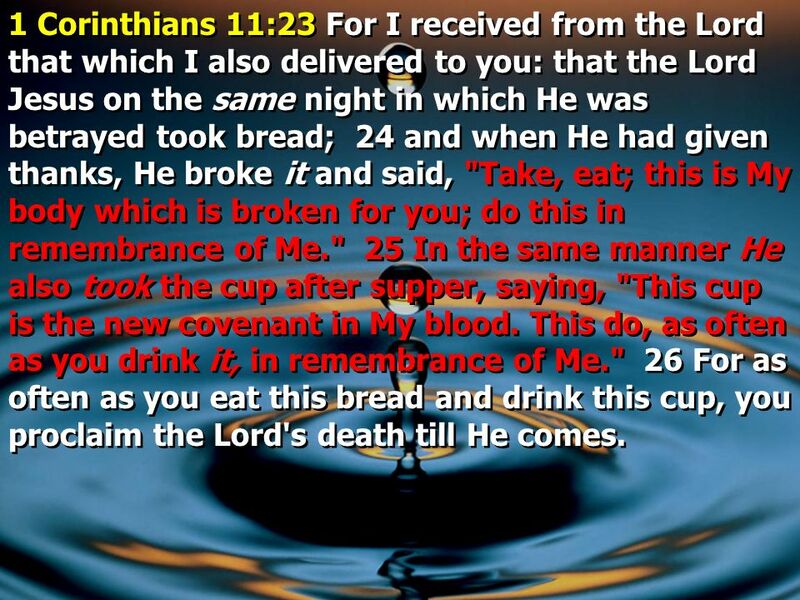 26 For as often as you eat this bread and drink this cup, you proclaim the Lord's death till He comes. 46 G. If every member acted like me, what kind of influence or example would they be? 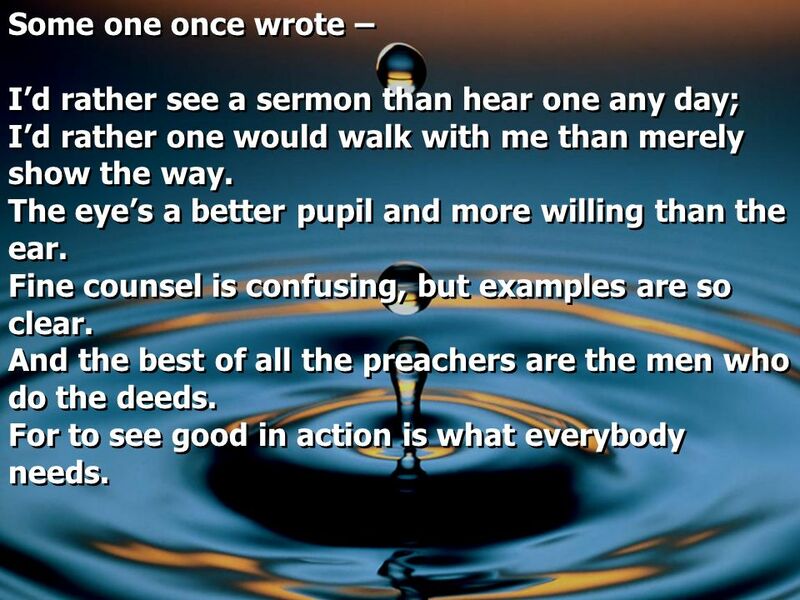 48 Some one once wrote – I’d rather see a sermon than hear one any day; I’d rather one would walk with me than merely show the way. The eye’s a better pupil and more willing than the ear. Fine counsel is confusing, but examples are so clear. And the best of all the preachers are the men who do the deeds. For to see good in action is what everybody needs. 49 Matthew 5:16 "Let your light so shine before men, that they may see your good works and glorify your Father in heaven. How’s it shinning right now - tomorrow? 50 H. If every member that is a parent were like me, what kind of example would they be? 51 Ephesians 6:4 And you, fathers, do not provoke your children to wrath, but bring them up in the training and admonition of the Lord. 52 I. If every member invited people to services like me, how much inviting would there be? 56 That short statement says so much which is important to the growth of the Church. We can say “everyone is welcome” until our throats are dry, we can write it on our marquee, print it in our bulletins and our tracts, but the fact remains that few non-members will come who are not personally invited. This is the way people are. Most of us don’t like to go where we feel like strangers. No need to kid ourselves! If we want people to come, we must bring them with us or be at the door to meet them when they arrive. 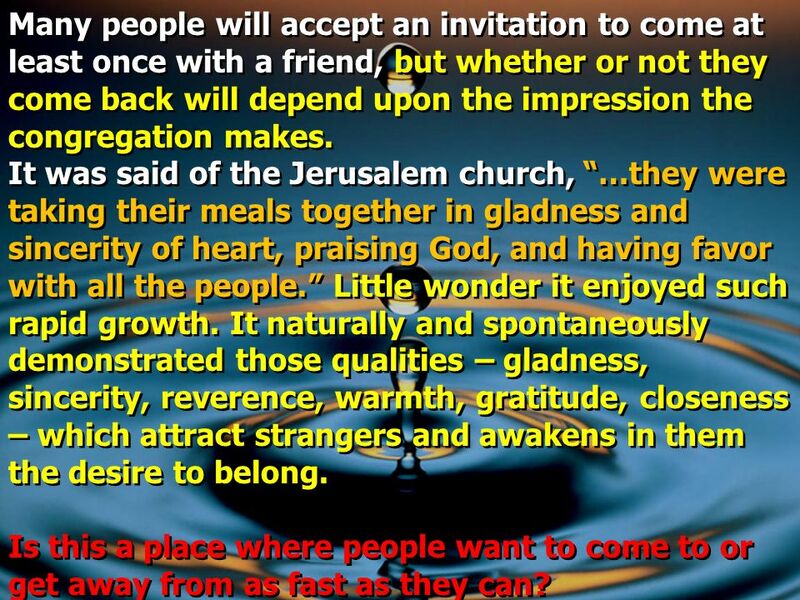 57 Many people will accept an invitation to come at least once with a friend, but whether or not they come back will depend upon the impression the congregation makes. It was said of the Jerusalem church, “…they were taking their meals together in gladness and sincerity of heart, praising God, and having favor with all the people.” Little wonder it enjoyed such rapid growth. It naturally and spontaneously demonstrated those qualities – gladness, sincerity, reverence, warmth, gratitude, closeness – which attract strangers and awakens in them the desire to belong. Is this a place where people want to come to or get away from as fast as they can? 59 If every member were like me, where will they spend eternity? Now that’s a BIG QUESTION, but you know all the preceding one’s and the way in which they are answered – will give the answer to this one. 61 Matthew 25:41 Depart from Me, you cursed, into the everlasting fire prepared for the devil and his angels: Will this be the answer? 62 IF EVERY MEMBER WERE LIKE ME WHAT KIND OF CHURCH WOULD THERE BE? 64 What MUST You Do to Be Saved? 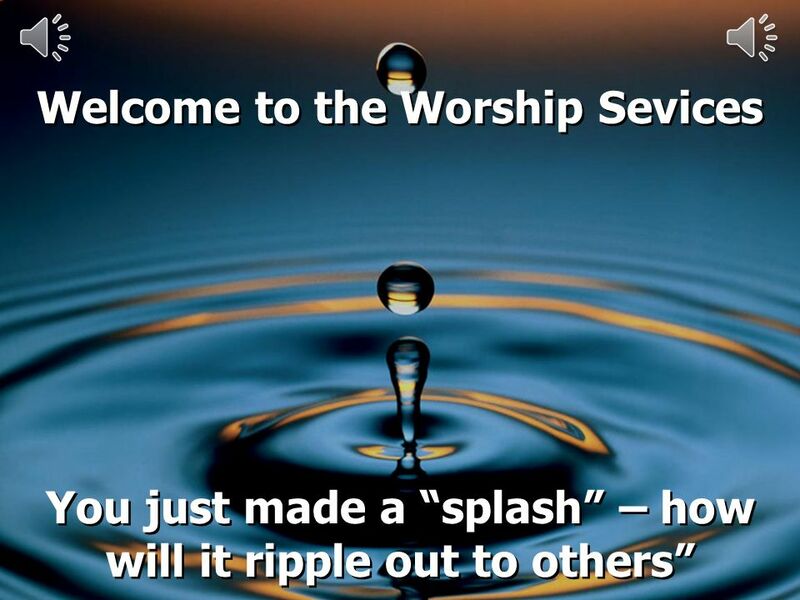 Download ppt "You just made a “splash” – how will it ripple out to others”"
The Life You Were Meant To Live. Getting Ready To Be Used By God Getting Ready To Be Used By God. Ephesians 2:19-22 Bible Reading Matthew 26:26-28 And as they were eating, Jesus took bread, blessed and broke it, and gave it to the disciples and.